It’s Friday which in some places always equals fish for dinner. This reminded me to hurry up and post my new fish recipe! I did promise a delicious new recipe after my less delightful mince post, so here it is. I’m very keen on Asian flavours, particularly Vietnamese as they use a wealth of fresh herbs and vegetables and the flavours are so light and refreshing. If I had to choose one cuisine to eat for the rest of my life it would be Vietnamese food. I also like salmon, but we’ve been eating it a lot lately so I decided it was time to mix it up a bit. With a fresh bowl of lemons and a bunch of coriander on hand I just jumped in and came up with this combination. The different elements complement each other really nicely and the dressing brings it all together. It’s been a big hit and I’ve made it quite a few times with Salmon and most recently Bream which was nice too. If cooking for more than 2 people I’d stick with Salmon or another thick fish. The steaks are thicker and narrower, so you can fit more pieces into the Varoma without covering all of the steam holes. Four Bream fillets proved a bit problematic as they overlapped completely blocking all of the steam vents meaning that the vegetables took a lot longer to cook. However I have easily done 6 portions of salmon. Despite the various different steps it is quite quick to put together. So give it a go next Friday, or even tomorrow, you won’t regret it. With blades running on Sp 8, drop lemon zest into bowl. Stop when you no longer hear the zest hitting the sides of the bowl. Add cashews and garlic to bowl. Press turbo briefly to partially chop. 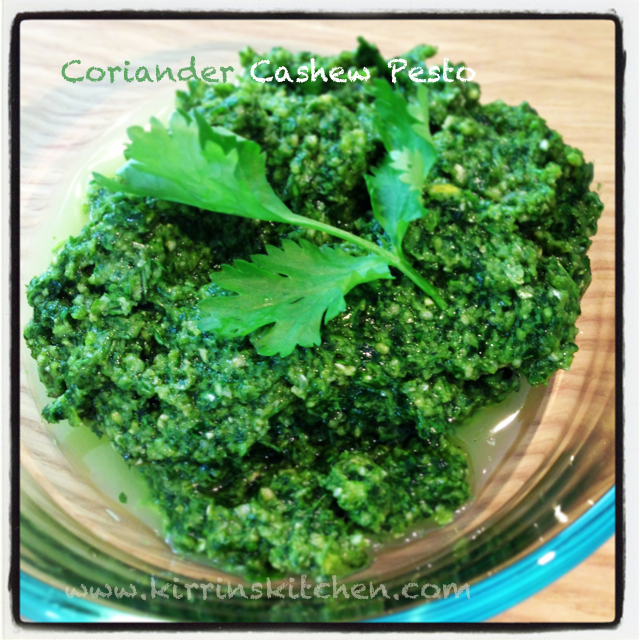 Add Coriander, whizz 2-3 seconds, speed 7. Add Oil, whizz 10 seconds, Reverse speed 2 to combine. Empty into small bowl and set aside. Rinse TM bowl (you don’t have to, but your rice may have a green tinge if you don’t). Add Coconut Milk and Water to the bowl. Insert simmering basket and weigh in rice into the basket. Scrunch baking paper under running water. Line the base of the Varoma with it. Pat dry salmon with paper towel (or pesto will not stick) and place it into the lined Varoma. 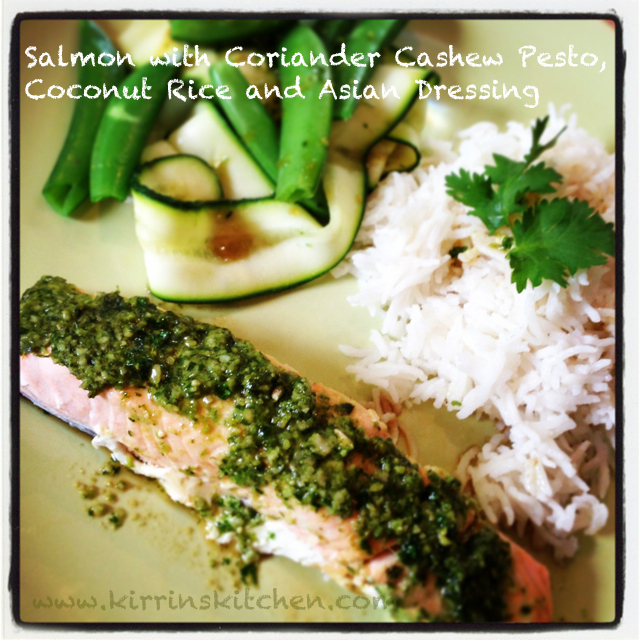 Reserve 1-2 teaspoons of pesto for the dressing and spread remaining pesto on the salmon portions. Place Varoma on top of bowl and steam 18 -20 minutes, on Varoma Temp, Sp 2.5 (if using a TM5 increase to Sp 3.5). While salmon and rice are cooking prepare the vegetables and place them onto the upper tray of the Varoma. Insert the vegetables into the varoma with there is about 2 minutes cooking time remaining. Nb If you are using vegetables which require longer cooking time (eg brocolli florets or thick pieces of carrot) add them sooner). While vegetables are steaming prepare the Dressing. Combine all ingredients in a small bowl and stir with a spoon. Place rice, fish and vegetables onto a plate. Drizzle with a small amount of the dressing. I’ve now added this recipe to the Australian Thermomix Recipe Community, so if you are a member and wish to save it to your favourites or give it a star rating, you can find the recipe here. 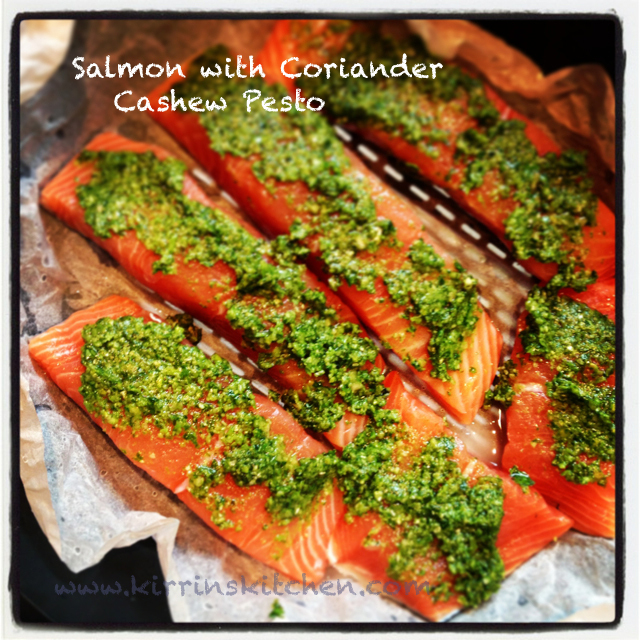 This entry was posted in All-In-One meals, Kirrin's Kitchen, Mains, Recipes and tagged All-in-one, Asian, cashew, coconut, coriander, dairy free, fish, gluten free, pesto, recipe, Thermomix, Vietnamese. Bookmark the permalink. « I’m Not Mincing Words (there’s collagen in those burgers).